In In Re Maatita, [2017-2037] (August 20, 2018), the Federal Circuit reversed the PTAB affirmance of the rejection of Maatita’s design patent application on the design of an athletic shoe bottom. The Examiner rejected Maatita’s application containing a single two-dimensional plan-view drawing to disclose a shoe bottom design and left the design open to multiple interpretations regarding the depth and contour of the claimed elements. and indefinite under 35 U.S.C. § 112, and the PTAB affirmed. in order to make and use applicant’s design. The Board concluded that because the single view does not adequately reveal the relative depths and three dimensionality between the surfaces provided, the Specification does not reveal enough detail to enable the claimed shoe bottom, under 35 U.S.C. § 112, first paragraph, and that the same lack of clarity and detail also makes the scope of the claim indefinite under 35 U.S.C. § 112, second paragraph. enable an average designer to make the design). The Federal Circuit said that a visual disclosure may be inadequate—and its associated claim indefinite—if it includes multiple, internally inconsistent drawings. However errors and inconsistencies between drawings do not merit a § 112 rejection, however, if they do not preclude the overall understanding of the drawing as a whole. It is also possible for a disclosure to be inadequate when there are inconsistencies between the visual disclosure and the claim language. However, the Federal Circuit said the present case does not involve inconsistencies in the drawings, or inconsistencies between the drawings and the verbal description, but rather a single representation of a design that is alleged to be of uncertain scope. The Federal Circuit said the question was whether the disclosure sufficiently describes the design. can disclose multiple embodiments within its single claim and can use multiple drawings to do so. perspective shown in the drawing. provided, two-dimensional depiction, Maatita’s claim meets the enablement and definiteness requirements of § 112. The Federal Circuit reversed the decision of the Board. It seems that the Federal Circuit is exempting design patent inventors from their part of the quid pro quo for protection — a complete disclosure of the invention. Will the Supreme Court bother with another design patent case? In In re Rembrandt Technologies LP Patent Litigation, [2017-1784] (August 15, 2018), the Federal Circuit held that the district court did not abuse its discretion in deeming this case exceptional, but that the court erred by failing to analyze fully the connection between the fees awarded and Rembrandt’s misconduct, and vacated the district court’s fee award, and remanded for further proceedings. Rembrandt asserted two patents that were revived improperly; allowed spoliation of evidence; improperly gave consultants an interest contingent on the litigation outcome; and threatened AOPs with a baseless injunction demand. The district court determined that the case was “indeed exceptional” for three reasons. First, the court found that “the evidence shows that Rembrandt improperly compensated its fact witnesses, in violation of ethical rules of conduct.” Second, the court was “convinced that Rembrandt engaged in (or failed to prevent) widespread document spoliation over a number of years.” Finally, the court found that “Rembrandt should have known that the ‘revived patents’ were unenforceable.” The district court ultimately ordered Rembrandt to pay more than $51 million in fees to all Appellees. an award of almost all fees was warranted or whether it had accepted appellee’s argument that the pervasive misconduct justified an award of all fees. The district court, by and large, did not even attempt to assess which issues the claimed misconduct affected. no explanation whatsoever of such a causal connection—was not enough. The Federal Circuit thus vacated the district court’s fee award and remanded for the district court to conduct the appropriate analysis in the first instance. In BSG Tech LLC v. Buyseasons, Inc., [2017-1980](August 15, 2018), the Federal Circuit affirmed the dismissal of an action for infringement of U.S. Patent Nos. 6,035,294, 6,243,699, and 6,195,652, directed to a “self-evolving generic index” for organizing information stored in a database, as being directed to ineligible under 35 USC §101. information” rather than any type of historical usage information, but this was not persuasive, because of the broad meaning of “summary comparison.” Third, BSG Tech insists that its claims focus on a non-abstract improvement in database functionality. Ultimately the Federal Circuit found that these benefits, however, are not improvements to database functionality. summary comparison usage information or relative historical usage information — which simply restates what had already been determined was an abstract idea. In JTEKT Corp. v. GKN Automotive Ltd., [2017-1828](August 3, 2018), the Federal Circuit the Federal Circuit dismissed the appeal of a PTAB determination that claims 2 and 3 of U.S. Patent No. were not unpatentable, because Appellee, JTEKT, lacked standing to appeal. 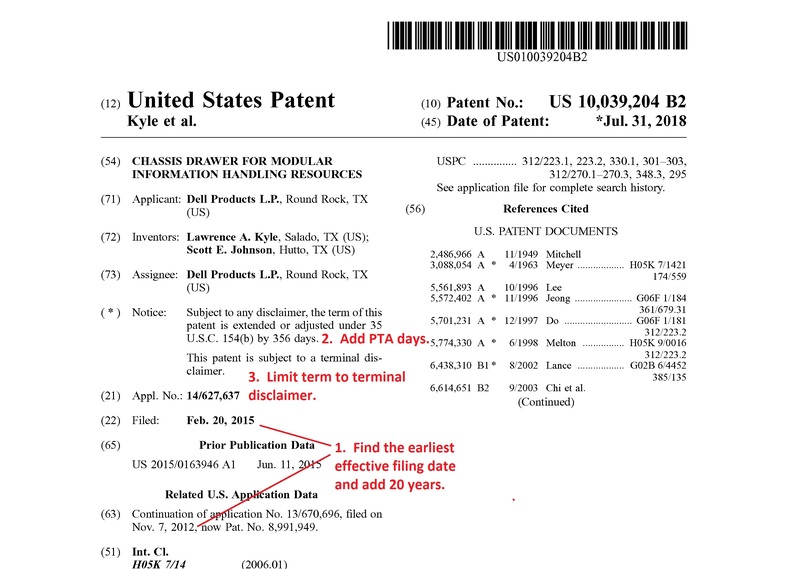 JTEKT filed a petition alleging that claims 1–7 of the ’440 patent were invalid. After the Board instituted as to all challenged claims, GKN disclaimed claims 1, 4, and 5, so the IPR focused on the patentability of claims 2 and 3.
not currently engaging in infringing activity, it must establish that it has concrete plans for future activity that creates a substantial risk of future infringement or likely cause the patentee to assert a claim of infringement. While JTEKT has submitted two declarations in support of its standing, these declarations do not establish that its planned product would create a substantial risk of infringing the claims on appeal. Because JTEKT has failed to establish an actual injury sufficient to confer Article III standing, we dismiss this appeal. Assuming the correctness of the Federal Circuit reasoning, this is another demonstration of how ill-conceived the AIA was. A party can challenge a patent in an IPR or PGR, but no matter how badly the USPTO handles the IPR, that party may not be able to appeal. Where is the justice in such a scheme? Should there be estoppel with respect to a decision that cannot be reviewed? That sounds even more unjust.